Growth Habit: Nodding thistle normally develops as a rosette in its first year and produces flowers and seed in the second. The young rosette is open in appearance, with the leaves pressed to the ground. As the rosette grows the leaf shape changes. In the adult plant the leaf has a long midrib with little or no winging, with spiny lobes arranged regularly on either side. If undamaged, the rosette produces a single stem, but if damaged by grazing, treading by stock or slashing, it will coppice strongly to produce a number of stems. The stems, up to 1.5 m in height and often branched towards the top, are spiny except immediately below the flower head. When buds emerge they are, at first, upright but as the flower head develops the stem below the head bends, resulting in the typical ‘nodding’. Type of Plant: biennial herb. Flowers: The flower head is a bright red-purple colour, approximately 50 mm across. The large flower head results in the production of a large number of seeds; a single plant may produce up to 7,000 viable seeds. The seed is 4 mm long and fawn in colour. It separates readily from its ‘down’ or pappus and most seed falls within a metre or so of the parent plant. A feature of this thistle in Tasmania is that adult plants appear capable of producing flowers and viable seed throughout the year. In some areas in Tasmania it is also capable of growing through to flowering in the one season, thus behaving as an annual. The main flowering period usually starts in December and continues through to autumn. However, in some seasons, flowering may commence as early as mid-October. Mature flower heads are large (30 to 40 mm in diameter) with purple florets. Fruit/Seed: Seed germination mainly occurs in the autumn, but if circumstances are favourable, it will also occur in spring and summer. Dispersal: Nodding thistle reproduces by a seed furnished with a pappus or ‘parachute’ of hairs which is capable of carrying the seed over long distances. However, the pappus separates readily from the seed, most of which falls within a few feet of the plant. Most seed is distributed by soil movement on farm machinery and vehicles, livestock and water movement. 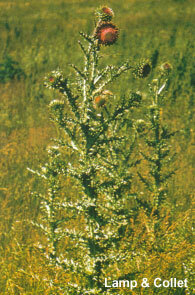 Distribution: The Nodding thistle occurs in small patches in all parts of the State. One or two new infestations are located nearly every year. Status: Nodding Thistle is declared a Noxious and Prohibited Weed under the Noxious Weeds Act 1964. Measures must be taken to eradicate all infestations and prevent seed production. Nodding thistle has proven an aggressive competitor in pastures. Rosette diameters exceeding 1 metre are common so losses through competition can occur even at low weed densities. New pastures are especially susceptible and if unchecked the weed can quickly dominate. Plants grow up to 2m tall and dense mature stands inhibit stock movement and reduce the accessibility of pasture to stock. Nodding thistle grows in dense patches and is not readily grazed because of its spiny foliage, although goats will graze the developing buds. Its presence also discourages animals from grazing neighbouring pasture plants. At maturity, the spiny heads contribute to vegetable fault in wool. Plants make strong autumn and winter growth, thereby competing at a time when pasture production is at its lowest. There is overseas evidence that the plant produces allelopathic compounds which could contribute to its competitiveness. Dense patches also provide harbour for pest animals, particularly rabbits. Seldom established in native perennial pastures, nodding thistle readily invades fertile pastures based on introduced annual species with elevated levels of nitrogen and phosphorus. As with other non-perennial plants, control is achieved by adequate cultivation. Ploughing and preparation for a crop will remove the thistles that have germinated but may leave a reserve of seed in the soil. This seed may germinate to produce thistles which will need to be dealt with in the crop. Some seed may lie dormant in the soil until later cultivations cause it to germinate. Grubbing, slashing and cutting. Cutting or slashing of plants at the bud or early flowering stage can be used to delay flowering or seeding but must be followed up by measures aimed at killing the whole plant. If the plant is in full flower, heads should be collected and burnt since seed may mature even on the cut stalks. Cutting will almost invariably cause ‘coppicing’ from the stem or rootstock. Where the number of plants involved is small, removal by grubbing is feasible. The thistle should be grubbed out to a depth of at least 50 mm as merely slicing off at ground level is insufficient and is in effect, no better than cutting. Chemical Control. An infestation may contain plants at various stages of maturity – seedlings, small rosettes, large rosettes, flower stem production, full flower or any combination of these. The control measure to be employed will depend both on the situation in which the thistles occur and on the stage or stages of growth of the weed. Resistance to herbicides increases with the age of the thistle. The most susceptible time and therefore the best time to spray is when the plant is in the seedling and small rosette stage. This means that to control an established infestation in pasture it may be necessary to spray in spring as well as autumn.